The code works well with the local example generated with the plugin project template, but when installing with the dart package its doesn't work : I get the following error. I first saw that in the local example project, the Podfile doesn't have the use_frameworks! command, so I removed it. But it fails too and the library doesn't seem to be present. Okay, after further investigation I now know why the sample project works, and not my actual project that depends on it through Pub. So the use_frameworks! directive makes senses in my Swift project, but why doesn't it achieve to reference the various transitive pods ? 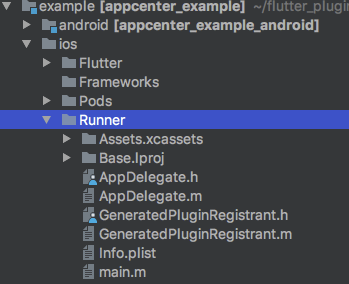 I also compared the AppCenter plugin to the Firebase plugin that are both implemented in Objective-C, with a dependency to a pod implemented in Objective-C. The only potential difference I see in Firebase/Core podspec, compared to AppCenter podspec that could be a problem is the s.static_framework = true directive. cc @mravn-google and @collinjackson who might have more insights. 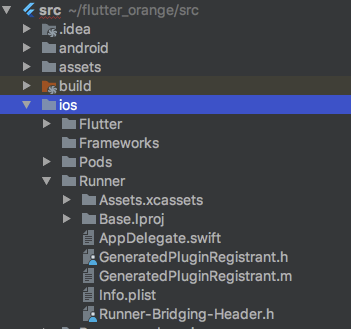 @aloisdeniel We do seem to need s.static_framework = true in podspecs when Swift is involved in the app and using CocoaPods 1.5.0 or later. FYI - I ran into this issue just yesterday when running my app on iOS for the first time in a while after having added in the google_map_flutter plugin. It turns out the fix was to replace my ios/Podfile with a newer one (I pulled the one from the google maps example). I believe mine was generated a few months ago when I started this project--I can't remember. In comparing it to the google maps flutter example Podfile there were quite a few differences and so it was easiest to just replace it. From this commit (flutter/plugins@20f9e7a ) I see that there is some work to clean up Podfiles in the plugins repo to make sure the latest is always used. It is used 14 times in the flutter/plugins repo to deal with transitive dependencies on static binaries. this is required for transitive dependencies.